NEWS – Casper is best known for making mattresses and pillows, now they’re getting into the bedroom lighting game with the introduction of their latest product the Glow. The Glow is a self-dimming light designed to help you wind down naturally for a better, deeper nights sleep. When you turn the Glow on it begins a 45-minute drift pattern that starts out with warm, bright light and gradually dims like the sunset. 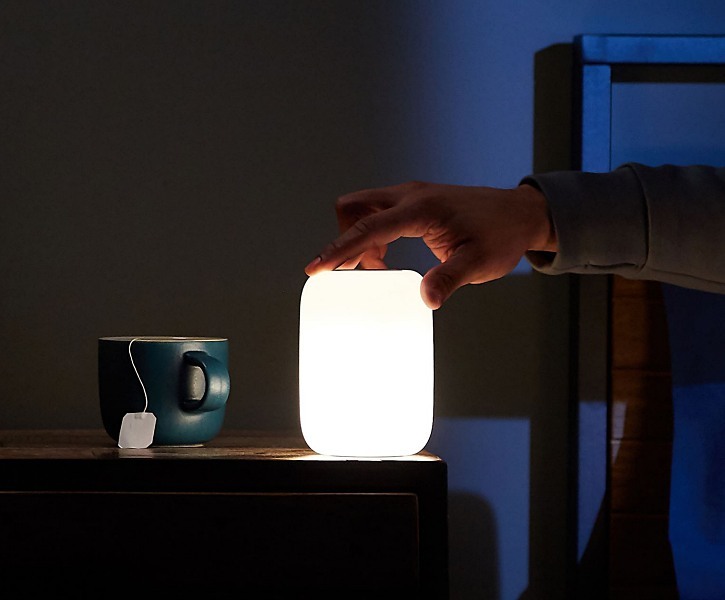 You can use the Glow app to schedule a wake-up time, so in the morning it will gradually fill the room with soft, warm light to gently wake you up. The Glow is gesture activated and can be turned on or off just by flipping it over. A built-in gyroscope lets you dim or brighten the light with just a twist. And the Glow is portable so you can use it in the middle of the night to light your path to the bathroom just by wiggling it. Glow can be used with or without the Glow app. The app allows you to set wake-up times and sync and manage a group of Glow lights together. Once synced up, when you interact with one light all the other lights in the group do exactly the same thing. The Glow is cordless and comes with a small base for easy charging. The Casper Glow Light can be purchased from their website for $89 for a single light or $169 for a double. And just like with their mattresses you get a 30-night risk-free trial to try it out.